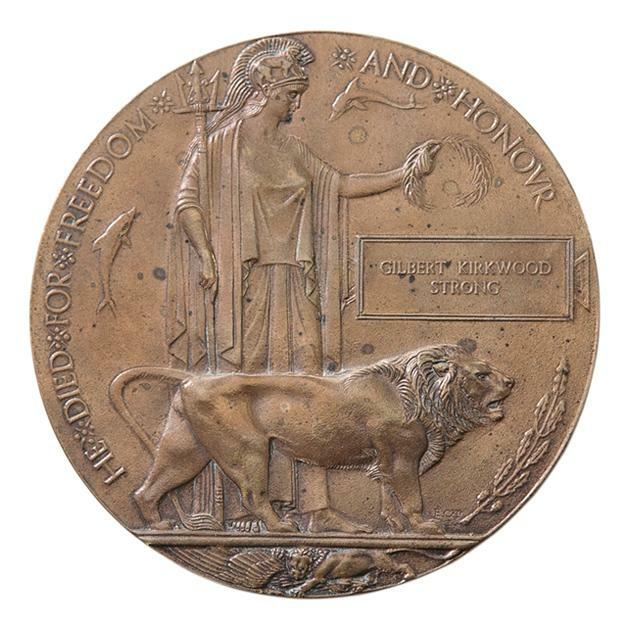 Death plaque sent to Mrs Ellen Strong of Lithgow after her son Private Gilbert Strong 20th (NSW) Battalion was killed in action on the Somme. The bronze plaque depicts Britannia and a lion, with Strong's name embossed in a rectangle. The plaque is surrounded by the words "He Died for Freedom and Honour". Strong enlisted at 18 years old, and was badly wounded at Pozieres, his first battle. After two months in hospital he returned to the Battalion and was killed by a sniper. He had just turned 19.